I was reading a blog post last week and the author had just discovered salads in a jar and she wrote something along the lines of "you will either think this is the best thing you've seen in a long time or you will be thinking this is so March 2014". Well these frozen banana ice-cream bites probably fall in the same category. However since this is a recipe that requires only 4 ingredients, takes minimal time & makes for a delicious guilt free treat I'm prepared to run the risk of being classified as out-dated. Frozen banana soft serve has been everywhere in the blog world for the past couple of years. You freeze some bananas and then blend them with some yoghurt and you have the equivalent of a healthy Barney Banana in a bowl in a just a few short minutes. If you haven't tried it yet, you must promise me you'll try it this week, you can thank me later! I've enjoyed 'banana soft serve' as a healthy after dinner treat for a while but until recently my husband has always declined to share the joy. On our recent holiday I had a few brown bananas that I had thrown in the caravan freezer and I made up a batch. Since he was devoid of other dessert options he conceded and had a serve. And guess what? He he has now made it at least 8 times since and is actively over buying bananas so we have to freeze them when they turn brown! He prefers to mix his up with a low sugar vanilla or fruit yoghurt but I prefer mine with Chobani 2% Greek yoghurt. 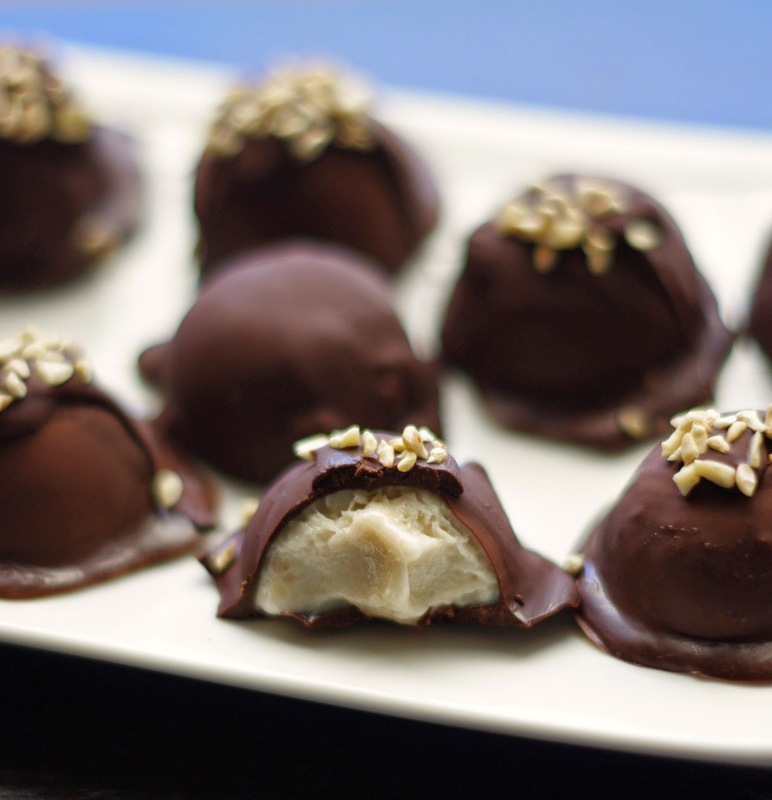 When we got home I wanted to take the banana ice-cream idea a little further and I thought I could make a healthier version of the bites I have previously made from my no-churn chocolate ice-cream. I also used xanthan gum when I made the 'ice-cream' for these bites, just because it makes the mixture a little thicker but that is purely optional. Xanthun gum is available from health food shops and the health food aisle of some supermarkets. The best tip for freezing your bananas is to peel them and break them into 3 or 4 before you place them in your freezer. I put mine in a zip lock bag. That way you can just grab out what you need for a smoothie or soft serve quickly and easily. It also makes it easier for the blender to break them down if they are already in smaller chunks. I used one half of my cake pop silicon mould to make these bites and when they are set they just pop straight out. You can obviously use any silicon mould you have or even just make some free form blobs on the baking paper and when they freeze they will set and be easy to dip in the chocolate. I used a skewer to hold each bite as I dipped it in the chocolate. 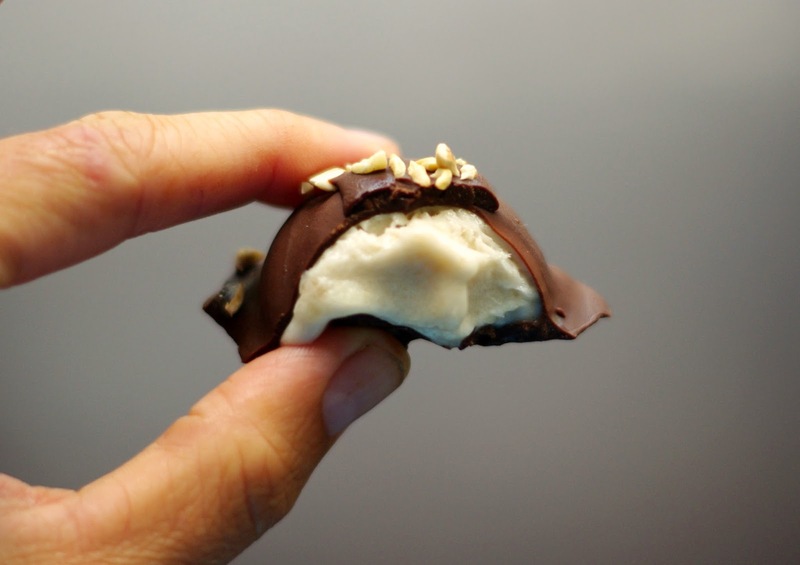 Avoid using a shallow bowl to melt your chocolate as this makes it more difficult to evenly coat your banana bites. I used some cashew nuts to sprinkle on the top, use any nut you prefer, crushed peanuts would work well. 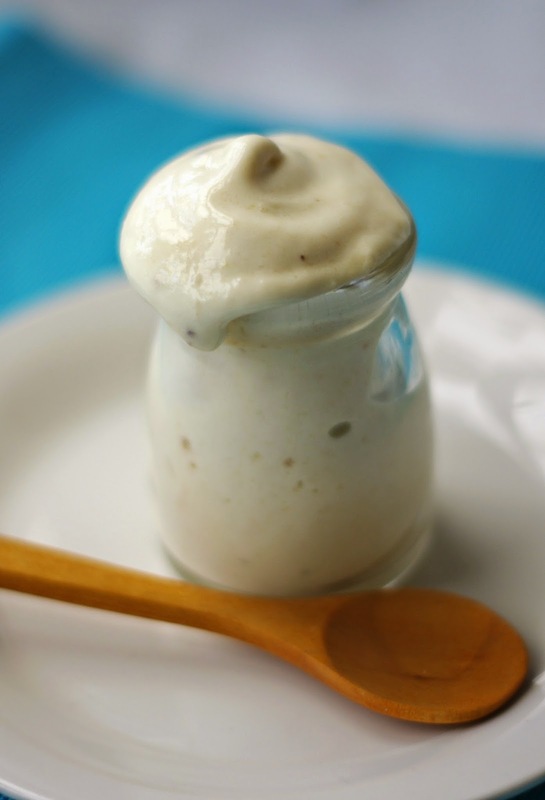 Blend the bananas and Greek yoghurt in a food processor or blender until smooth and resembling the consistency of ice-cream. Spoon banana mixture into your selected silicon mould and place in freezer. 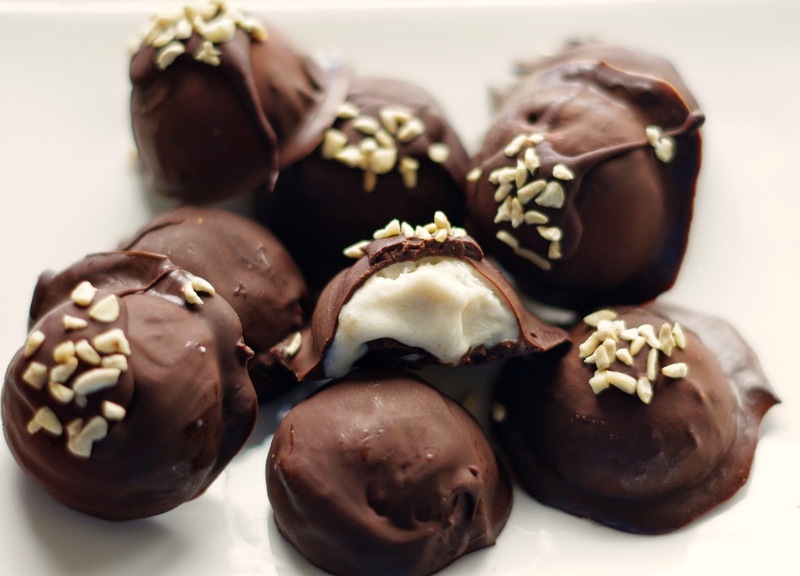 When banana bites are set, melt chocolate and coconut in oil in microwave in 30 second bursts, stirring in between. 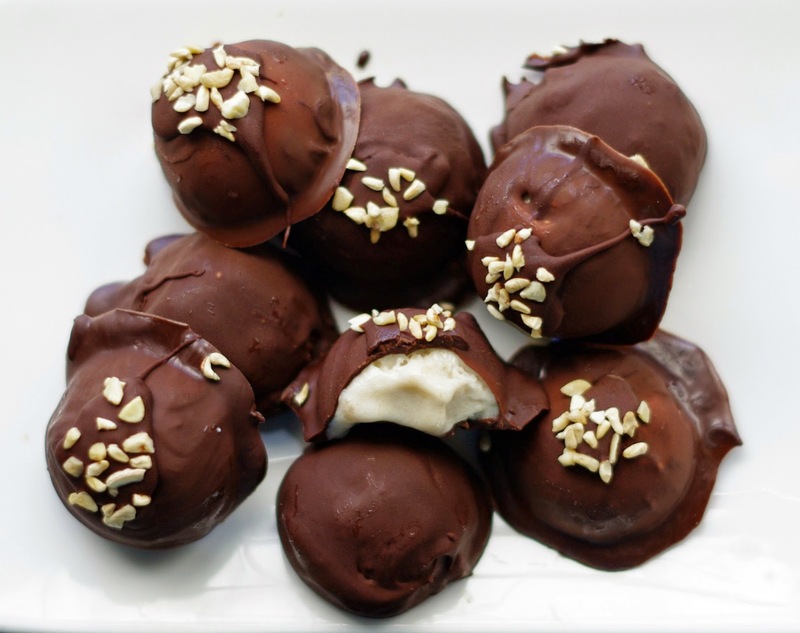 Dip banana bites into melted chocolate to coat and place on tray lined with baking paper. Sprinkle with nuts quickly before chocolate sets. Return to freezer until you are ready to eat them! Oh my Gosh, Danielle. These look amazing!! You are one clever lady. I have never done the frozen banana and yoghurt thing. I'll have to try it as I think the kids will love it. Thanks Renee, do try it, you won't be disappointed! Thanks Aanika, I hope you enjoy! I'ma fan of frozen whipped banana but you just took them to the next level - yum! I need a little bowl of these next to me right now. Thanks Malinda, it does step them up a whole new level. It's lucky that they aren't kept in fridge or else I'd eat one every time I opened the door - at least I forget about them in the freezer! Yummo!!! Maybe it is March 2014, but today when it's 38 degrees, these would be fab - and a bit decadent!! !